Although traditionally sown in February, germination is slow, and sowing in April or May is often more successful. If the weather is cool and damp slugs will eat the lot. Sow thinly in rows 30cm apart. The ground should be fertile but not recently manured with fresh FYM, as this may cause roots to fork. They need to be kept weed free and protected from slugs as they germinate. Thin to 10cm as soon as possible. 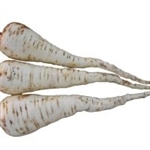 The first parsnips can be dug in October and they will store in the ground until at least February. Shorter and with broader shoulders than Tender and True, suitable for shallow soils. It also has considerable cancer resistance. About 400 seeds.